Last Friday, I started a series of French lessons which I plan to turn into a permanent tab on my blog. Homeschooling would not be complete without at least one foreign language, right? Today, let’s look at one of the most famous French songs ever: Alouette. Children use this song to learn the names of body parts in French. 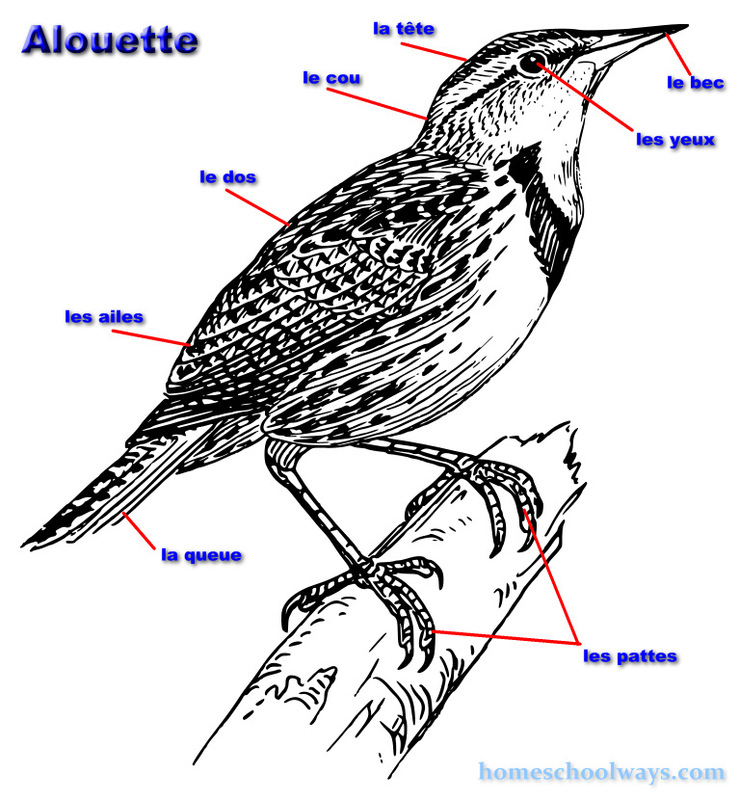 Repeat the above with: le cou, les ailes, les pattes, la queue, le dos. Little skylark, I’ll pluck your feathers off. Apparently, a lark woke the song writer up one morning and he was not an early bird (no pun intended) or a card-carrying member of PETA. He calls the lark “lovely” or “nice” (gentille) though, which intrigues me. The song may have originated in France, but it is also attributed to Québec, the French-speaking Canadian province. To hear the pronunciation, here’s a youtube video with a kid-friendly arrangement. Hope this little French song enriches your homeschool day!